Now, I am thinking of starting a new series of posts called Farm to Table. The idea was inspired by my CSA baskets. Every week, I am amazed at the freshness of the produce that we get. Ok, yes, we could definitely use less lettuce and more other veggies. But, I can't deny that the quality of the produce is simply fantastic! So, the Farm to Table series will showcase a particular ingredient from my weekly basket. Needless to say, this will be seasonal as also organic. 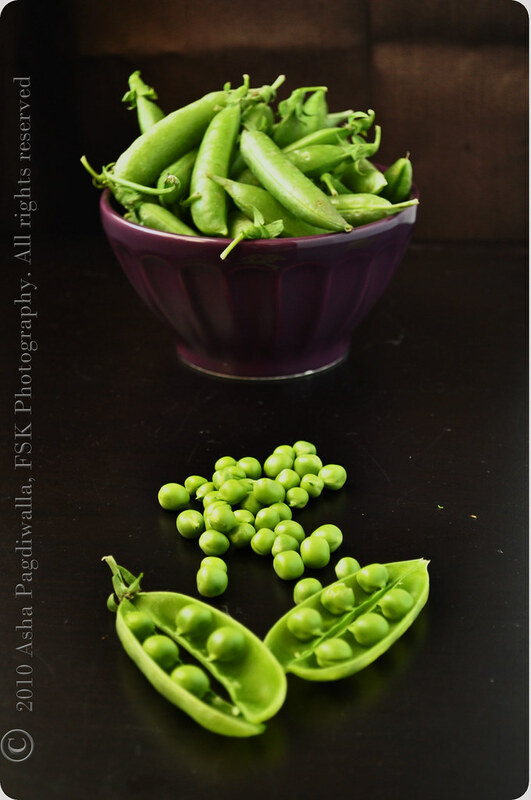 I am kicking off this series with my first post on crunchy, sweet Snap Peas. Snap peas have a delicately sweet flavor which makes them perfect for snacking on. I typically eat a few just raw. I usually prefer to not cook them too much and try to retain their crunch as much as possibly. 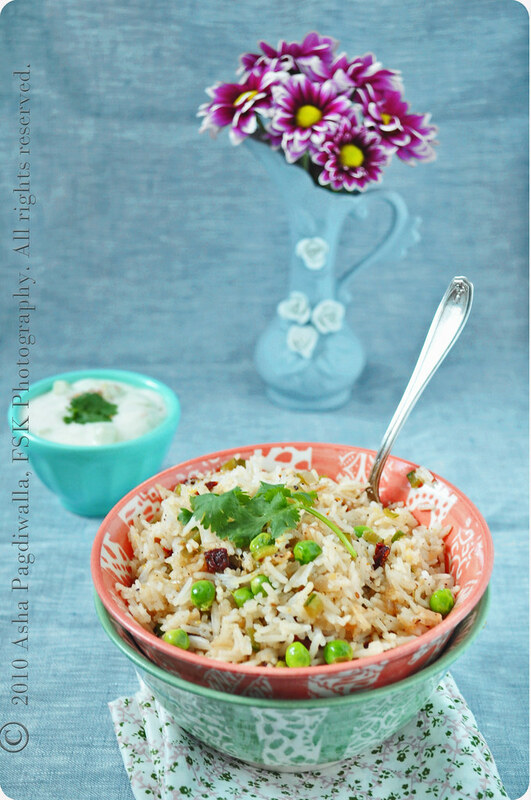 A light saute of blanched peas with a touch of nutmeg makes the perfect side. My earliest memory of these peas is of my mother shelling them painstakingly in the evening to prep for the next day's lunch. They were seasonal in India too, atleast in the sense that they were affordable only for a short period during the year. And, then, it would a be pea overload at home for a while. But, I didn't mind it. I loved peas. Besides, I wasn't a fussy kid at all. I ate 99% of the veggies and usually cleaned my plate..err! 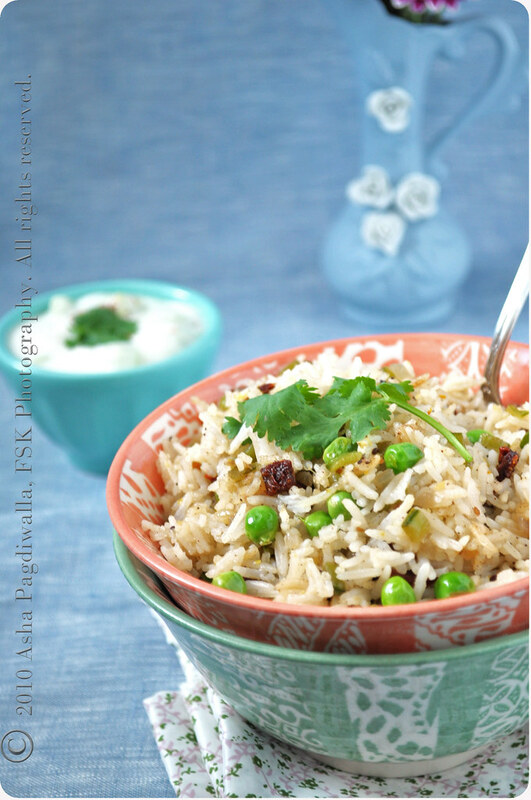 The one dish she always made with fresh peas was Peas Pulav. She would also chop up the pods and add them to the pulav. The pods have an intense pea flavor and are a great source of fiber and vitamins and are low in calories. They would be fantastic in pea soups and purees. 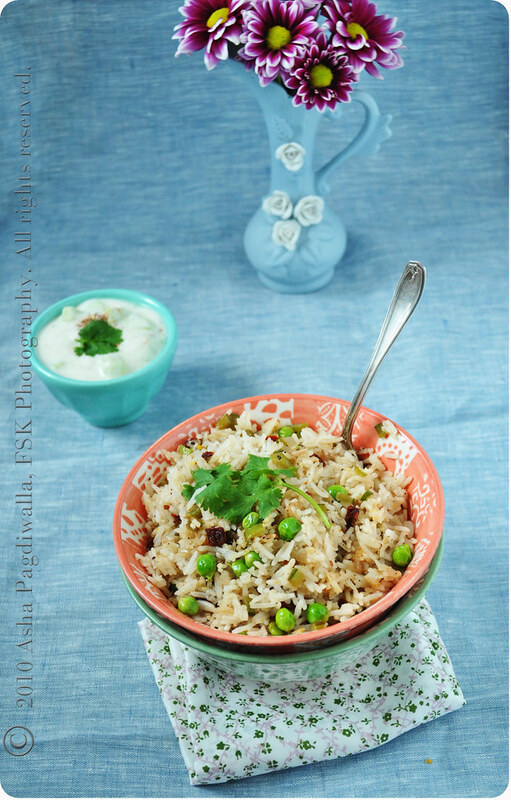 So, with my first batch of farm fresh peas, I decided to do a twist on the pulav. I lightly sauteed the peas and finely diced pods in butter and spiced them with a touch of five spice. I tossed them into rice and served it warm. I imagine this warm salad would be great with couscous as well. Saute the onions, ginger and garlic scape in butter. When the onions are translucent, add the diced pods and peas and lightly saute until you can smell the peas. Toss in the sundried tomatoes and saute for a minute more. Season with salt and sprinkle in the five spice. Off the heat, gently fold in the cooked rice, zest and lemon juice and rewarm the mixture. Serve warm with cucumer raita. Mix all the ingredients together. You can thin it down with water if needed. Chill until serving time.